Let Sears clean your home and office spaces—with free in-home consultation and $25 off for first-time customers. Whether you’re looking for regular housekeeping service or one-time help with a big cleaning before a party, Sears Maid Service can help. Sears maids will dust, mop, wash and sanitize your kitchen, bathroom, bedrooms and living areas. We clean the things you never remember to clean, like picture frames, lamps and trim—even the doorknobs. If you want regular housekeeping, we can come to your home weekly, every other week, or once a month. Or request a single visit for a top-to- bottom house cleaning. Sears maids are trained, background checked, licensed, bonded, and insured—and your satisfaction is guaranteed. Trust our licensed, bonded, and insured maids in your home. New customers get a free in-home consultation to customize services that fit your personal needs and comforts. Includes cleaning and sanitizing bathrooms and kitchens, vacuuming, dusting & more. Impress your clients and manage happy employees with a clean and healthy work environment. Services include office, kitchen, bathroom, and breakroom cleaning, as well as trash removal. Move-in, move-out, and post-construction cleaning services available. Why choose Sears Maid Services? Regular cleaning for houses and apartments. Whether you schedule a one-time cleaning or regular visits, Sears Maids service cleans the kitchen, bathrooms, bedrooms, family room, living room, dining room and hallways. 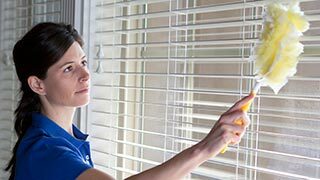 Sears Maids cleans all floors; washes mirrors; and dusts baseboards, windowsills, picture frames, ceiling fans, vents covers, window blinds and lamp shades. When Sears Maids cleans your kitchen, our staff cleans the sinks and floors, sanitizes the countertops, cleans the range hood, and cleans and sanitizes all appliances—even inside the microwave. Bathroom cleaning includes cleaning the bathroom floor, countertops, and the outside of the bathroom cabinets; and cleaning and sanitizing all sinks, tubs, showers and toilets. Our bedroom cleaning service includes dusting, cleaning the bedroom floor, and making the bed—we even change the sheets if requested. Moving cleaning. If you’re moving into a new home or just moved out of one, you already have plenty to deal with. Have Sears Maids take care of cleaning the empty house or apartment. Sears Maids vacuums and mops floors, cleans toilets and countertops, and more. We make sure your new home is sanitized and well-cleaned for your arrival. Deep cleaning. When your house needs a big cleaning, call on Sears Maids for a top-to- bottom house cleaning. Maybe you’re expecting a houseful of quests, or are getting ready to sell your house, or want to finish your spring cleaning before summer. When you request a deep cleaning, Sears Maids do a regular cleaning and will clean the inside of the oven, refrigerator and range hood; wash the inside of the windows; vacuum upholstery and clean under beds and couches (if accessible); and dust and wipe baseboards, window blinds, window sills and cabinet exteriors . They also spot clean doors, walls and door trim; sanitize electrical outlet covers, light switches, wastebaskets and door knobs, and give showers and tubs an extra-good cleaning. Office cleaning. The cleanliness of your office says a lot about your company. Let Sears help you make a good impression with a one-time cleaning or regular cleanings. The Sears cleaning technicians clean the reception area, offices, common areas, the kitchen and break room, and bathrooms. Our cleaning staff empties trash; dusts window sills, blinds, desktops, office machinery, cabinets and baseboards; and cleans the floors. In the kitchen and break room, we wash dishes and wipe down faucets, appliances and cabinets; clean the microwave inside and out, and cleans and sanitize countertops. In bathrooms, Sears cleaning technicians clean and disinfect bathroom fixtures and restock towels, toilet paper and soap dispensers.